In a Lawless Land Ruled by the Gun, He's the Law. Logan: Them papooses - I'd keep 'em out if I was you. If it ain't nailed down, they'll steal it. Matt Dillon: They live here. Logan: Well, I guess a squaw is better than no woman a'tall, huh? Matt Dillon: You were given 15 years in territorial prison, Logan. What are you doin' out? Logan: Lookin' for you. Been a long look, Dillon, but I promised myself I'd pay you back. Here I am. Q: Is Matt the father of the two Indian children seen at the beginning of the show? Best TV "reunion" movie ever. 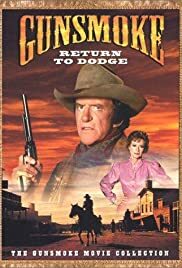 Gunsmoke cast regulars James Arness (Matt Dillon), Amanda Blake (Kitty) and Buck Taylor (Newly) reunite for a pretty good old fashioned western. The plot involves the release from prison of Matt's most deadly foe, Steve Forrest, reprising his role as Will Mannon, bent on revenge. Another Gunsmoke alumni is along for the ride, Earl Holliman, who does a good turn as Jake Flagg. According to reports, Ken Curtis held out for too much money and subsequently did not reprise his role as Festus, what remains of his part is filled in by character actor Mickey Jones as Oakum. Too bad, it would have been great to see him don the spurs one more time. Milburn Stone (Doc) who appears along with Festus in flashbacks, had passed away by the time this film was made. There are several minor plot holes, chief among them is that in the episode, "Mannon" the title character was killed at the end, apparently while the end credits rolled, Doc discovered that he was still alive, saved him and he was then sent to prison. All in all, this film holds true to the legacy of the great, classic TV series.